See them pouring across grassland in great crowds, jostling one another like excited football fans queuing for the Big Match, and you could (almost) forgive the anthropomorphic attribution to these mushrooms of the cry ‘We are the Champignons’. 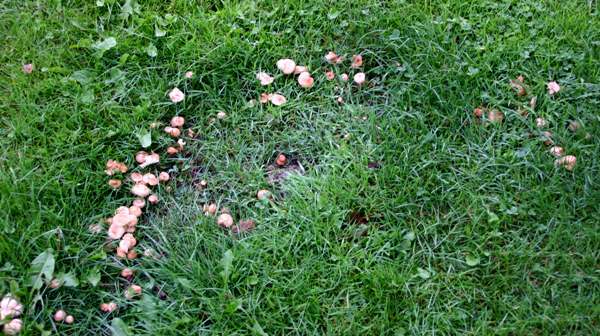 In Britain and Ireland the Fairy Ring Champignon is widespread and common, as it is throughout mainland Europe and most of North America. This and other members of the genus Marasmius are sometimes referred to as 'resurrection mushrooms' - they can dry out completely in hot sunny weather and yet, when eventually rain soaks them, they reflate and regain their characteristic shape and colour. 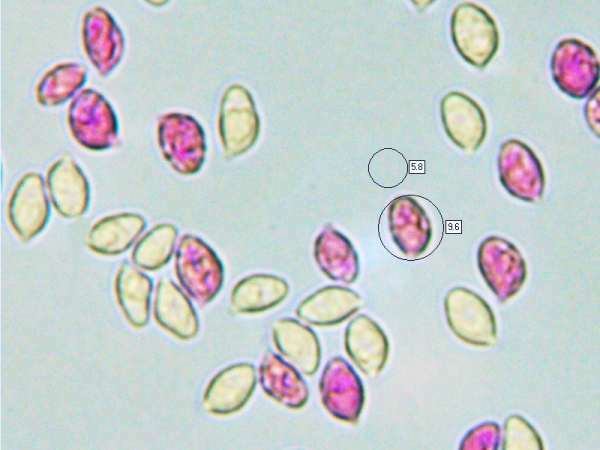 Not only do the reconstituted mushrooms look like fresh young fruitbodies but they are also able to create new cells and to produce new spores. These Lazarus-like characteristics are the result of Fairy Ring Champions and other Marasmius fungi containing a high concentration of the sugar trehalose, which prevents catastrophic cell damage when the fruitbodies become desiccated. In fact Fairy Ring Champions can continue producing new spores despite a series of drying-and-wetting cycles. Not surprisingly, in view of its persistent nature, this is a very common mushroom and seems to thrive in public lawns and parks, often surviving even where people walk quite frequently. 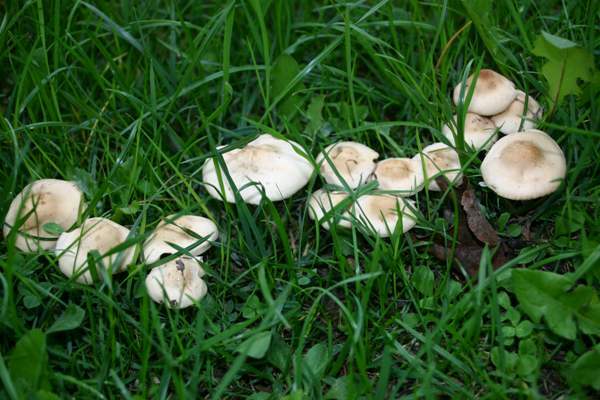 Never use the fact that fungi are growing in fairy rings as a basis of identification: many edible and several seriously poisonous mushrooms are capable of producing fairy rings. It is therefore important to base identification of Marasmius oreades upon as many of the listed characteristics as possible. If a specimen fails on even one of the characteristics listed below, it is likely to be something other than a Fairy Ring Champignon. The fairy ring shown above was one of several such rings that appeared overnight on a regularly-watered riverside lawn beside the River Madison in Montana, USA, in early July 2013 with a n umber of other grassland fungi, including Milky Conecaps Conocybe apala. 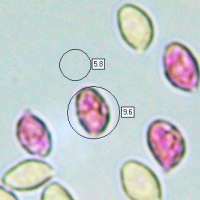 This saprobic grassland fungus was first described validly in scientific literature in 1792 by the English naturalist James Bolton. It was the great Swedish mycologist Elias Magnus Fries who, in transferring it to the genus Marasmius, established its currently-accepted scientific name Marasmius oreades. 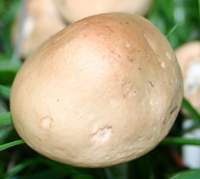 Synonyms of Marasmius oreades include Agaricus coriaceus Lightf., Agaricus pratensis Huds., Agaricus oreades Bolton, Agaricus pseudomouceron Bull., Collybia oreades (Bolton) P. Kumm., and Scorteus oreades (Bolton) Earle. The genus name Marasmius comes from the Greek word marasmos, meaning 'drying out'. Elias Magnus Fries, who separated the Marasmius genus from the similar white-spored Collybia fungi, used as a key differentiating factor the ability of Marasmius mushrooms to recover if rehydrated after drying out. Fries called this characteristic 'marescence'. The origin of the specific epithet oreades are the Oreads or Oreiades, nymphs (in Greek mythology) of mountains, valleys and ravines - all of which are places where Fairy Ring Champignons might be found, but these mushrooms are certainly not confined to such locations. As the common name suggests, these little mushrooms often create fairy rings (of the turf-killing kind gardeners dislike). The fairy rings made in parkland are often almost perfect circles, but when a ring intercepts a path where either animals or people tread frequently then the varying nutrient levels and soil densities result in differential growth rates of the underground mycelium. As a result, the fairly ring becomes misshapen where it crosses a footpath. An older common name for this mushroom is Scotch Bonnet. 2 to 5cm across; initially convex, flattening with a broad umbo; hygrophanous, orange-ochre or tan, drying buff or pallid cream; smooth, sometimes with very faint marginal grooves or striations. Adnexed or free; distant; white at first, becoming cream. 4 to 8cm long and 2 to 6mm diameter; tough and pliant; white or buff, darkening towards a white and downy base; cylindrical, base sometimes slightly swollen; smooth and dry; stem flesh is whitish buff. Ellipsoidal to pip-shaped, smooth, 8-11 x 4-6μm; inamyloid. Odour mushroomy but not distinctive; taste mild, slightly nutty. Saprobic, in grassland and occasionally on woodland edges. 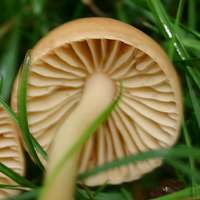 Agrocybe praecox, the Spring Fieldcap, has buff gills that darken and produce brown spores. 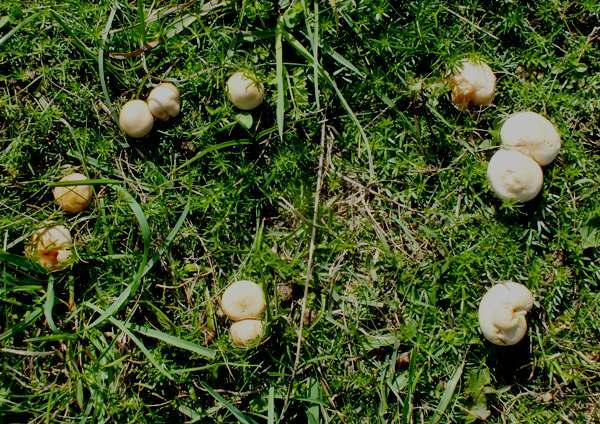 Fairy Ring Champignons that appear early in the year are pretty safe, but extra care is needed from mid summer onwards because a few toxic toadstools are likely to pop up in the same locations as Marasmius oreades. Clitocybe rivulosa and Clitocybe dealbata - both white spored mushrooms of grassy habitats - can sometimes produce fairy rings. 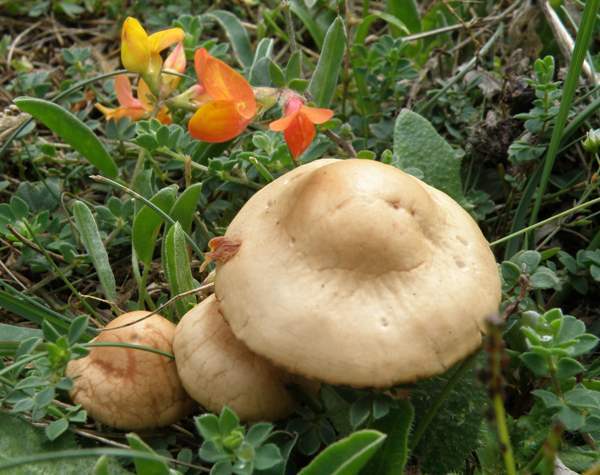 Their caps vary from white to ochre brown and are convex but not umbonate; also their stems are much stiffer and less pliant than those of Fairy Ring Champignons. As ever: if in doubt, throw it out! Fairy Ring Champignons are widely regarded as good edible mushrooms, particularly suitable for use in soups and stews, although most people who collect them for eating discard the tough stems and use only the caps. Marasmius oreades are sweet-tasting because, in common with other species from the same genus, they contain trehalose, which is a kind of sugar. These mushrooms are also great as the basis of sauces for pasta dishes and are quite good in omelets too. Fairy Ring Champignons are ideal for drying for long-term storage because, as you might expect if you read the notes at the start of this page, they reconstitute very well indeed.